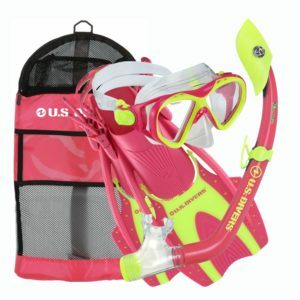 This article is for parents who wish to buy snorkeling gear for their kids. 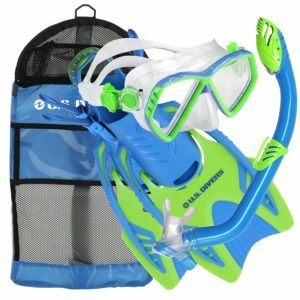 First I’ll outline some of the biggest things to look for when purchasing a kids snorkeling set. 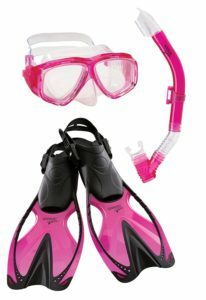 Then I’ll list the pros and cons of some of the best snorkeling gear for kids. 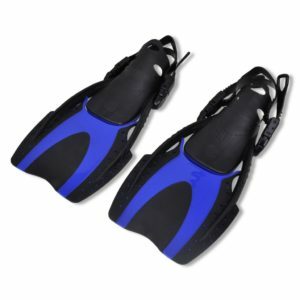 Comfort is a primary concern when purchasing snorkeling gear for your kid. 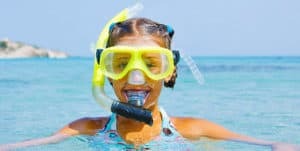 While adults may be able to tolerate an uncomfortable snorkel setup for a few hours, a kid may more readily complain about an ill-fitting mask—which may end your snorkeling excursion early! On the other hand, the most comfortable gear will be more expensive. You need to weigh how often you plan on snorkeling with the demands of your budget. Someone who plans on snorkeling a couple of times on one vacation would probably be fine buying a cheap setup, in contrast to someone who lives next to the ocean and plans on going every weekend. 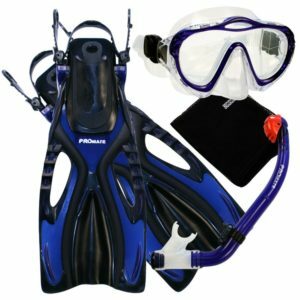 While most of the best deals on snorkeling gear can be found online (see below! ), you won’t be able to have your kid try on online gear before you buy it. 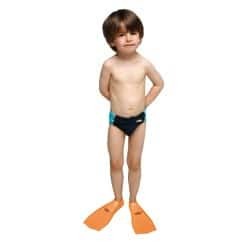 In some cases, it’s preferable to have your kid try on gear in person before you invest in a snorkeling setup. This will ensure a proper fit and that your kid feels comfortable wearing his or her new mask and fins. Dive shops are great places to try on gear. Once you’ve tried out the gear in person, you can always look up the gear you liked online for a cheaper, internet-approved price point. Kids snorkeling masks are just like the masks for adults—only smaller. The same principles apply whether you’re shopping for an adult or a child’s mask. Masks come with various types of lenses, although most entry-level masks will be of the same single-lens construction. The factor of kids snorkeling masks that will make the most difference to your kids experience will be the type of material that comes in contact with their face, known as the skirt. The skirt of most good snorkeling masks are made of silicone, which is soft against your face and provides a good seal. Cheap masks (and sadly, when it comes to kids snorkeling masks, there are too many to count on the market) are made with a plastic skirt. A cheaply made mask with a plastic skirt will be bad on two accounts. Number one, the mask seal tends to be poorer, and will usually degrade faster over time—meaning more chance of water getting in your kiddos’ eyes. Number two, the plastic is not as comfortable against your face. After a long snorkel session, your kid may end up with chafed cheeks and a sour attitude toward future snorkeling trips. 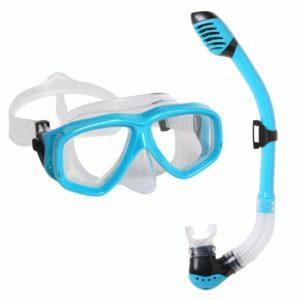 The type of snorkel you buy is perhaps the most important thing when purchasing snorkeling gear for your kid. 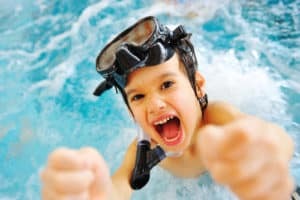 Not only will it determine how comfortable your child will be in the water, it can prevent a potentially catastrophic incident from happening. Drownings have happened due to malfunctioning snorkeling gear. 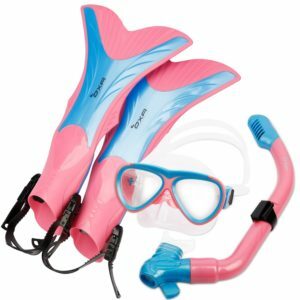 Of the many types of snorkels, the type I recommend for kids are dry top snorkels. 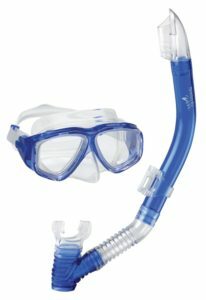 A dry top snorkel simply means a snorkel that prevents—or greatly reduces—water from entering the top of the snorkel. This includes water from splashes at the surface or from when you dive under the surface. 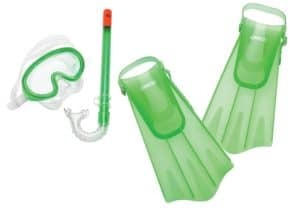 The mechanism by which these snorkels work vary from model to model, but most of them involve a valve that closes off the top of the snorkel when the top is submerged under water. 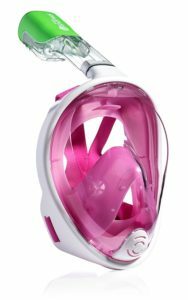 Dry top snorkels prevent your kid from accidentally inhaling a mouthful of seawater, which is always a hazard for children (indeed, anyone!) trying to snorkel for the first time. Non dry top snorkels have their own strengths (particularly if you dive deeply and frequently) and have a simpler construction where less things can go wrong. 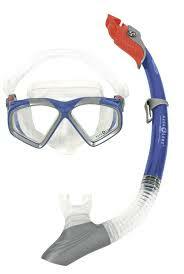 However, when it comes to buying gear for kids, I wouldn’t consider anything other than a dry top snorkel. If you do want to get a non dry top snorkel (maybe you found a good price), make sure the snorkel at least has a splash guard, which prevents splashed water from entering the snorkel. In recent years, full-face snorkels have entered the market. Where normally the mask and snorkel are separate in a snorkeling set up, a full-face mask combines the two. The lens of the mask covers most of your face and forms a seal that includes your mouth. 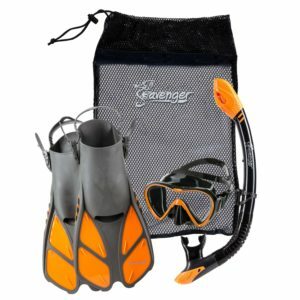 This offers a marked advantage over traditional snorkels, especially for beginners. For one, you don’t have to clamp down your mouth over a mouthpiece, which can lead to an ache in your jaw. And two, you don’t have to learn how to breath through a snorkel, which can be tricky for beginners—you simply breath naturally. 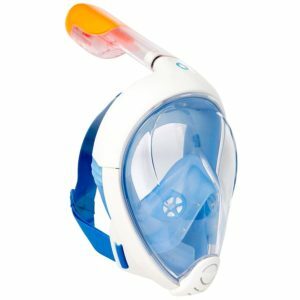 Full-face masks also come in kids sizes, so it’s worth considering this type of snorkel when shopping for your child. The major downside is that they cost a lot more—up to five times as much as a traditional snorkel. When buying for a child, the main thing to look for in fins are adjustability. The best kids fins will have a strap you can adjust on the back of the fin. Since kid’s shoe sizes vary wildly, and they grow each year, you’ll want some leeway in terms of how tightly the fins can be cinched down onto their feet. Another thing to consider is the comfort of the fins. Just like masks, some fins are made with soft silicone, which is the most comfortable material fins can be made out of. But some are made from harder plastics, which can chafe your feet and generally cause discomfort. If you can afford it, opt for silicone fins—your kids will thank you for it! 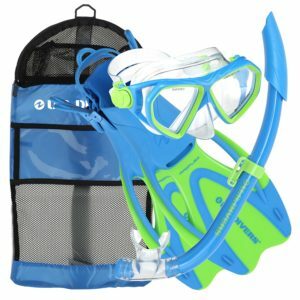 For adults, all you really need to snorkel are fins, a mask, and a snorkel. But kids have special considerations that may warrant other pieces of gear. The first thing you might consider is purchasing a wetsuit. Kids body temperatures run colder than adults, and they’re also more vulnerable to conditions like hypothermia. Because of all this, they often get colder in the water faster than adults, and are more prone to getting sick because of it. But them wearing a wetsuit prevents this. I didn’t list any wetsuits below, but they can be easily found online or in any dive shop. Definitely get one if you plan on going anywhere near cold water. Another useful product to have is called a snorkeling vest. These resemble life preservers or PFDs: your kids head sticks up through the middle of it, and the rest of it hangs down on their frontside like a vest. The vest provides some floatation for the kid, so they can conserve energy and focus on snorkeling and seeing the sights—and not about keeping above water. 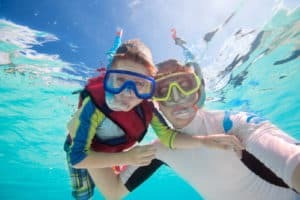 So snorkeling vests are for your kids enjoyment, but they’re also for safety, giving you, the parent, peace of mind knowing they won’t drown when you’re off looking at some cool fish or reef. A quick note about sizing… Finding the right size for your kids snorkeling gear is difficult. Many company’s kids large is another’s kids small. And for almost all snorkeling companies, kids masks come in only one size, which is a major bummer. The best thing you can do to ensure a proper fit is to try one gear in person, as a dive shop, for instance. You can always leave the store empty handed after trying things on, then buy whatever you liked best from the internet.